A - Amnesia. Robert Horton left Wagon Train at the peak of his popularity to pursue movie stardom--but eventually returned to television as an amnesiac trying to discover his identity in A Man Called Shenandoah. B - The Barkley family in The Big Valley (hey, that should really count as two B's). C - Cheyenne, which debuted in 1955 and became a huge hit for Warner Bros. television. Some sources claim it's the first hour-long, dramatic TV series to last longer than a season (although it was originally part of an umbrella series). D - Death Valley Days, the long-running half-hour anthology hosted by (in order) Stanley Andrews, Ronald Reagan, Robert Taylor, and Dale Robertson. Sponsored by 20 Mule Team Borax! Hoss says: "Don't call me Eric!" E - Eric Cartwright...yep, that was Hoss's actual first name in Bonanza. F - F Troop. The antics of Sergeant O'Rourke (Forrest Tucker) and Corporal Agarn (Larry Storch) made life interesting for the somewhat-clumsy Captain Parmenter, who commanded Fort Courage. G - Gunsmoke, the granddaddy of them all. 'Nuff said! 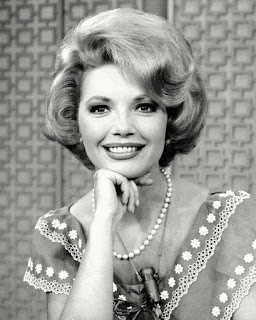 H - The High Chapparal, the name of the ranch in the other Western family saga created by David Dortort (see "P"). Incidentally, the ranch was named after a bush--you probably knew that already, but I didn't until recently watching the pilot episode again. I - The Iron Horse, the 1966-68 series with Dale Robertson as a railroad owner. Dale fared better in the earlier Tales of Wells Fargo. J - Jesse James, who was turned into a good-looking nice guy in The Legend of Jesse James starring Christopher Jones. 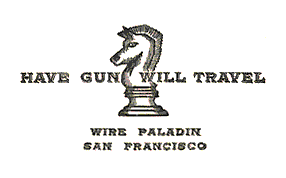 K - The knight chess piece that appeared on the card of Paladin on Have Gun--Will Travel. 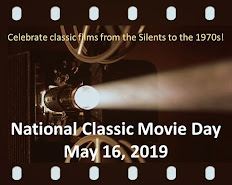 L - The Loner, an offbeat Western created by Rod Serling and starring Lloyd Bridges as a former Union officer trying to figure out the meaning of life. M - Maverick, the lighthearted series about poker-playing brother Bret (James Garner) and Bart (Jack Kelly). After Garner's departure, cousin Beau (Roger Moore) and later brother Brent (Robert Colbert) joined the cast. N - Nichols was James Garner's ill-fated return to the TV Western genre. Although the title character was similar to one he played in the hit film Support Your Local Sheriff, the TV show flopped. The producers tried to save the series by killing off Nichols and having Garner plays his more likable twin brother. Hugh O'Brian as Marshal Earp. O - Hugh O'Brian, who became one of the big TV Western stars when he headlined The Life and Legend of Wyatt Earp (1955-61). 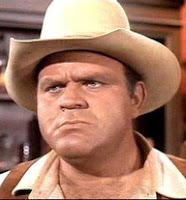 P - Ponderosa, the name of the Cartwrights' ranch in Bonanza (which was also created by David Dortort). Q - Quest. Several Westerns revolved around characters on a quest, such as Will Sonnett (Walter Brennan) and his grandson Jeff (Dack Rambo) searching for Jeff's father in The Guns of Will Sonnett. A more traditional choice for "Q" is Quint, the blacksmith on Gunsmoke played by Burt Reynolds. R - The Rifleman, the popular series about a widowed father (Chuck Connors) and his young son (Johnny Crawford). Crawford was popular enough to score five Top Ten hit songs on the Billboard charts. S - Silver, the Lone Ranger's white stallion. 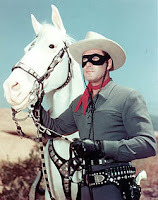 Also, the Lone Ranger used silver bullets to always remind him that life is precious. T - Trampas, the ranch hand played by Doug McClure in The Virginian. 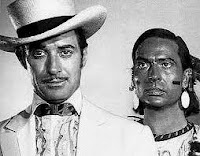 McClure and James Drury (see below) were the only actors to remain with the 90-minute series through its nine-year run. U - Uncle Buck (Cameron Mitchell), Billy Blue's surrogate father on The High Chapparal; Blue's actual dad, Big John, showed only tough love for his son. (Really, if you can think of a better "U", please leave a comment). V - The Virginian, as played by James Drury. Just as in Owen Wister's novel, we never learn the ranch foreman's name. W - Johnny Western (great name, huh? ), the singer who croons "The Ballad of Paladin" at the end of many Have Gun--Will Travel episodes. There are a lot of good "W" choices, to include Wagon Train, Wishbone from Rawhide, and James T. West. Yancy and sidekick Pahoo (played by X. Brands). Y - Yancy Derringer (played by Jock Mahoney), a dandy who owned a riverboat and sometimes worked as a sort of secret agent. I thought he was cool because of the four-barreled derringer up his sleeve. Another choice for "Y" might be Johnny Yuma (Nick Adams) from The Rebel. X - I'm sure there were cattle in some Westerns that had "X" branded on their butts. Yes, that's lame, but I'm claiming it for this tough letter. Z - Zorro, as played by Guy Williams. Annette Funicello had a crush on him, so for her birthday, Walt Disney cast her as a guest star opposite Guy in an episode of Zorro. "The Loner" sounds really interesting. I never knew Rod Serling had a western show involvement. Kevin, there are some episodes of THE LONER on YouTube and the quality is pretty decent. I will definitely check them out. Thanks for the heads up. "L" should stand for "Laramie." Just sayin'. I considered LARAMIE, then forget about it when I compiled my list! You know, Robert Fuller had a successful TV career after LARAMIE, with WAGON and then later EMERGENCY. But John Smith only appeared as guest star in a few shows. Show business success is hard to figure out sometimes. L could stand for Laredo. Just sayin'. Another great choice! You know, I watch Peter Brown in RIDE THE WILD SURF last year and couldn't get over seeing him with blonde hair. It just didn't look right! As for Philip Carey, he certainly had a long run in ONE LIFE TO LIVE. I haven't seen that show in ages. It'd be a great pickup for the Encore Western channel. Another clever list, Rick, including my favorites "Have Gun Will Travel" and "The Rifleman." I enjoyed your choices for Q and X, especially! Splendid list! As a western buff, I regret that there are no westerns on TV anymore.